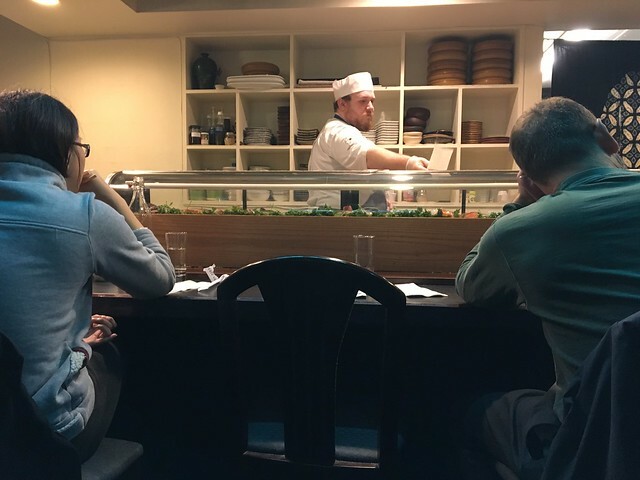 Cafe Sushi is the most unique sushi place I've ever been to. 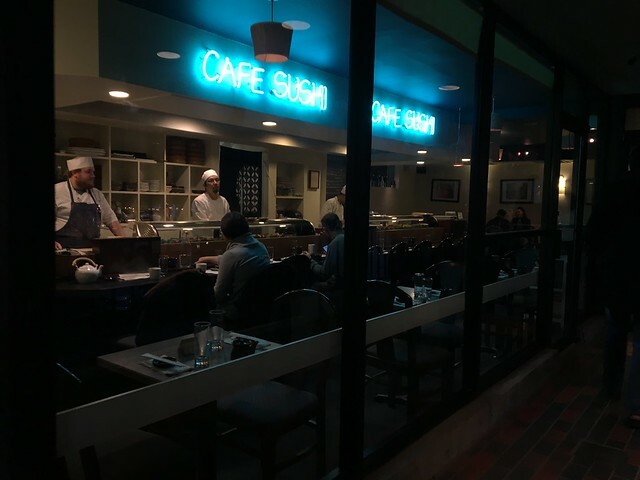 Not only is it fresh with a menu changing daily to reflect a selection of seasonal fish, but it has an artistic take on classic sushi plates. It's truly a fun experience. I actually ate here with Josh, because Kaitlynn had prior commitments. So, we took the T to Cambridge and luckily were seated without any wait at all. 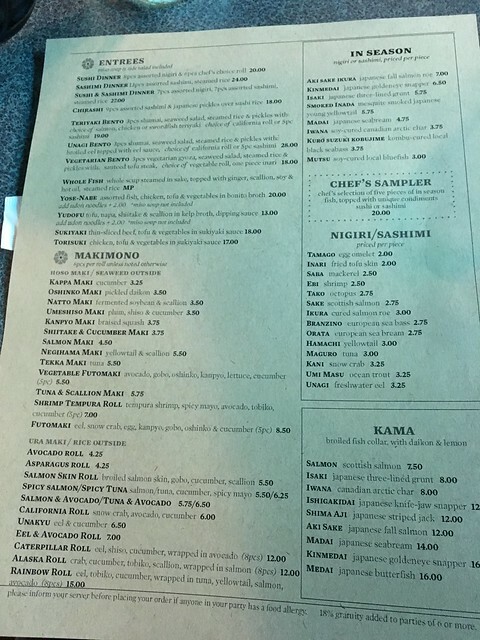 The menu features signature maki, entrees, makimono and signature creations. 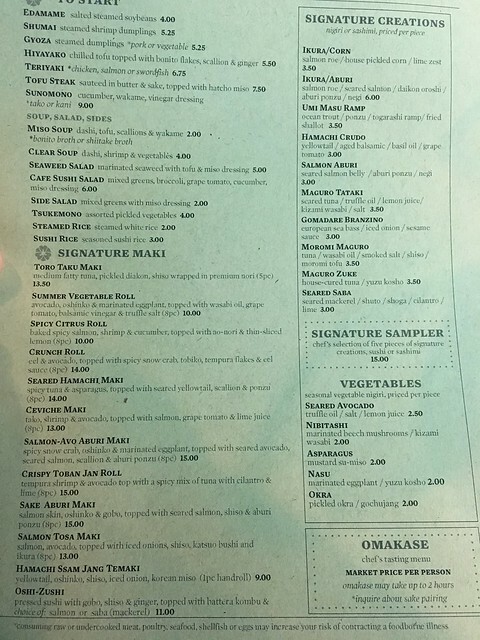 The signature creations along the right side of the menu are single pieces of sushi or sashimi. There are items like "Salmon Aburi," which is seared salmon belly / aburi ponzu / negi. There's also "Maguro Tataki," which is seared tuna / truffle oil / lemon juice / kizami wasabli / black salt. So, there are some really interesting, unique flavor combinations here. I started with a piece of the Hamachi Crudo: yellowtail / aged balsamic / basil oil / grape tomato. One piece of sushi was $3, but wow, was it worth it! 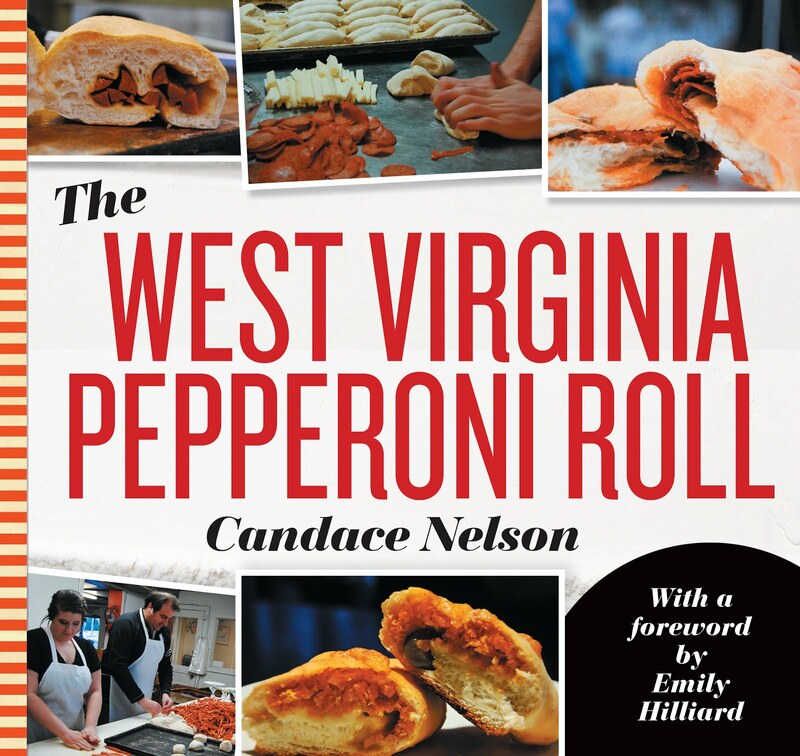 That one small bite had so much flavor. The freshness is unrivaled - no gumminess or fleshiness. It was supple, the right balance of firm and soft. And, the taste was great - the balsamic really complemented the gentle flavor of the fish. Seriously good. 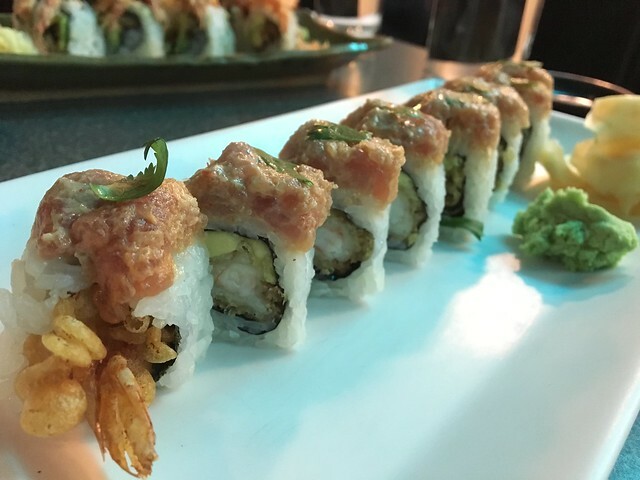 I also ordered the Crispy Toban Jan Roll, which is tempura shrimp and avocado, topped with a spicy mix of tuna with cilantro and lime. 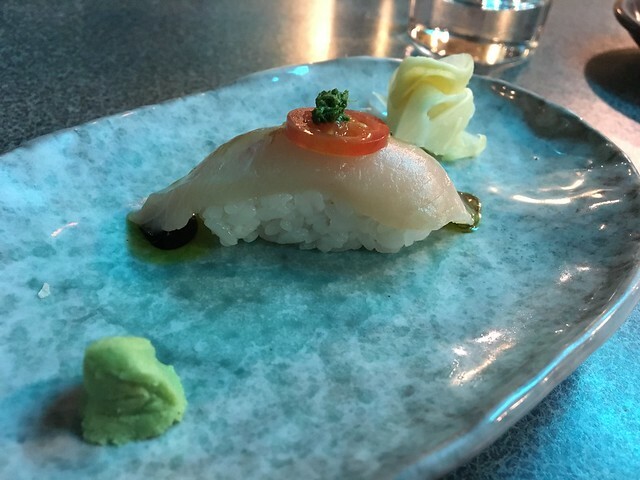 I also liked this a lot, though it was more on the traditional side of what I'd expect, and after having that one bite, I was wanting more of the unique rolls. It was quite delicious, and the cilantro added a uniqueness. 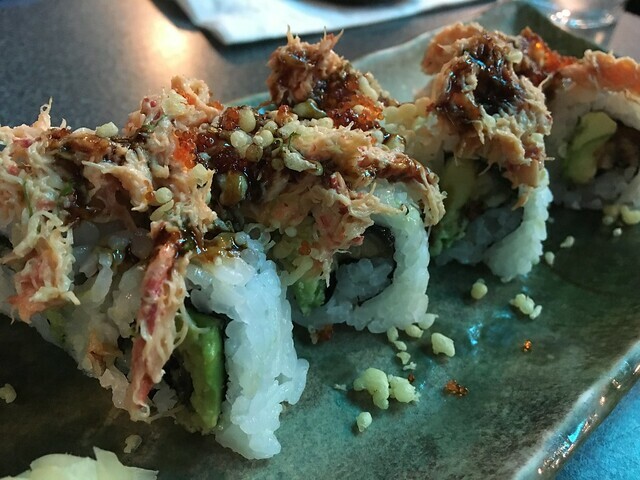 Josh ordered a Crunch Roll, which had eel, avocado, topped with spicy snow crab, tobiko, tempura flakes and eel sauce. I stole one of his rolls, which was very, very good.